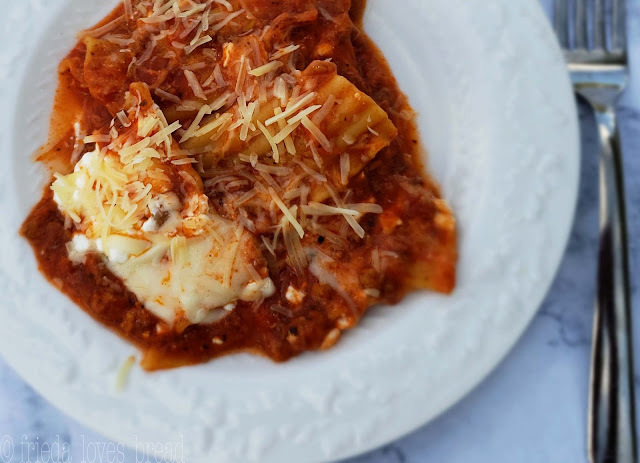 This lasagne comes together oh, so easy, and is perfect for those busy and hot weeknights when the family is hangry. 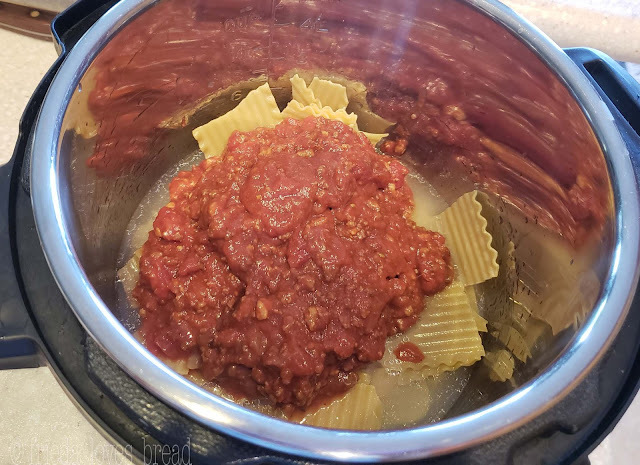 A perfect sauce to noodle ratio and paired with a fresh green salad, it is sure to satisfy your entire family and can be on your table in 20 minutes with your pressure cooker. I looked everywhere for mini mulfada pasta... you know, the kind that looks like mini lasagne noodles and come in a box of Hamburger Helper? I broke regular lasagne noodles into 2" pieces. Apparently, if you are Italian, breaking your pasta is like breaking a commandment. Each time you break pasta, you are breaking the hearts of 1,000 grandmothers. Or something like that. Anyway, back to the hangry kids and getting the lasagne started! 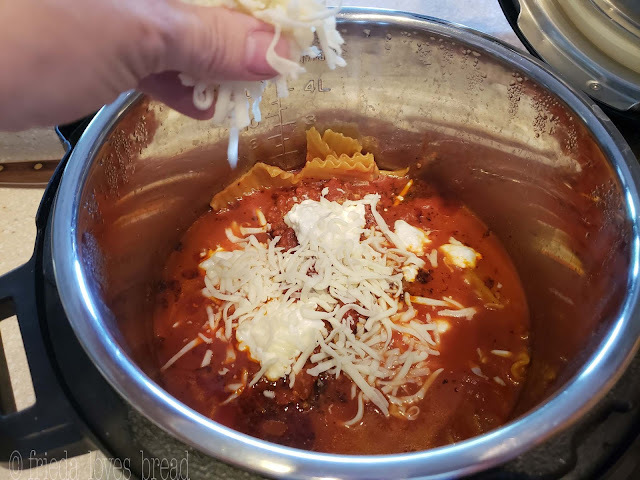 I patterned this recipe and used the layering tips from my One Pot Meat Spaghetti recipe. 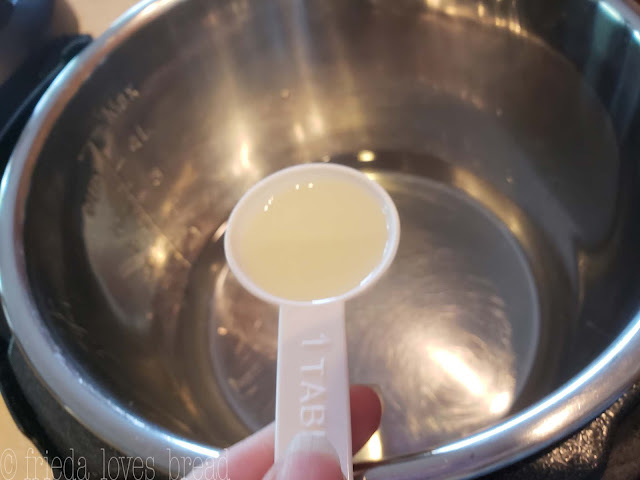 Start by adding water to your pot and stir in a tablespoon of cooking oil. This will help keep your pasta from sticking together. Stir in your broken pasta, coating it well with the oil/water mixture. Dump in your favorite pasta sauce, right on top. Do not stir. 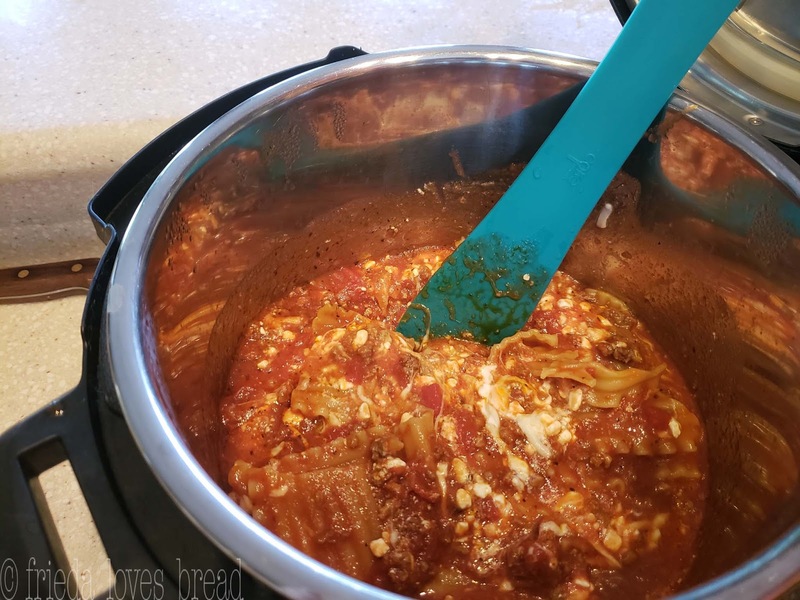 I made some fantastic meat spaghetti sauce in the pressure cooker a few days ago, and using some of it is a great idea for this recipe. Close the lid and pressure valve, set it for 6 minutes on high pressure. Check the box of your pasta for the cook time and cut it the time in half. My Western Family lasagne box has a 12-14 minute cook time. 6 minutes will give you al dente and 7 minutes will give you a softer pasta. 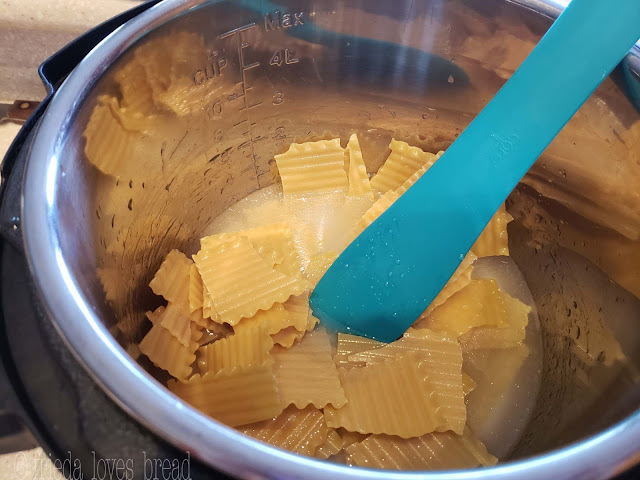 Use a quick release of pressure, open the pot and begin adding your cheese. I like to use cottage cheese and mozzarella. Then put the other half of the cheeses on top. Close the lid and wait a couple of minutes. Sprinkle some Parmesan cheese on top, serve with a green salad on the side and Presto! Dinner is served and kids are happy. 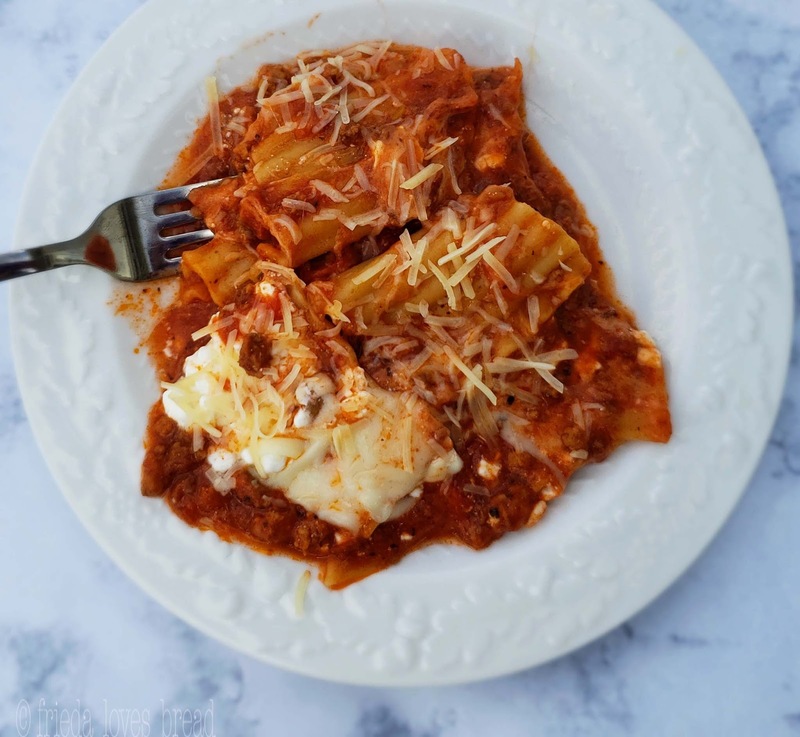 Make your busy weeknights easier with this fast and easy lasagne. 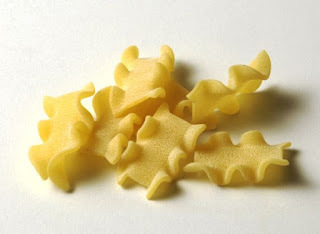 The key is to preventing your pasta from sticking together is to coat it completely with the oil/water mixture. Use your favorite bottled sauce or make your own. 1. Pour water into pressure cooker insert and add cooking oil. Stir.2. Stir in broken lasagne noodles, coating all of the pasta well.3. Pour spaghetti sauce over noodles. Do not stir.4. Close the pressure cooker and pressure valve.5. Select HIGH pressure for 6-7 minutes. 6 minutes will give you al dente and 7 minutes will give you softer pasta.6. After the cook time, use a Quick Release by opening the pressure valve.7. Dollop half of the cottage cheese and sprinkle 1 cup of the mozzarella onto the sauce and stir. 8. Dollop the rest of the cottage cheese and the other 1 cup of mozzarella on top. Do not stir. 9. Cover the pressure cooker and let sit for 2 minutes. 10. Open the cooker, serve hot, with a generous serving of shredded Parmesan cheese.